I wouldn't say my bike is fully modified, at least not yet. 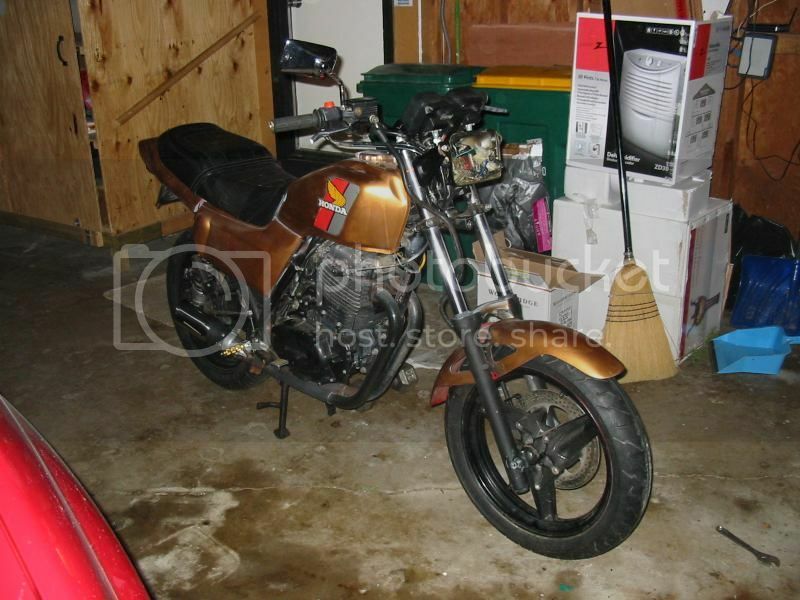 Here it is at an earlier stage with CBR600F wheels on it with the stock front end and brake. The brake rotor from a VT750C fits on to the CBR wheel and is the same diameter as the FT rotor, The offset is slightly different so I just trimmed the caliper mount slot a little and let the caliper slide in a little closer to the wheel and self align. I rode it on the street this way for a while. 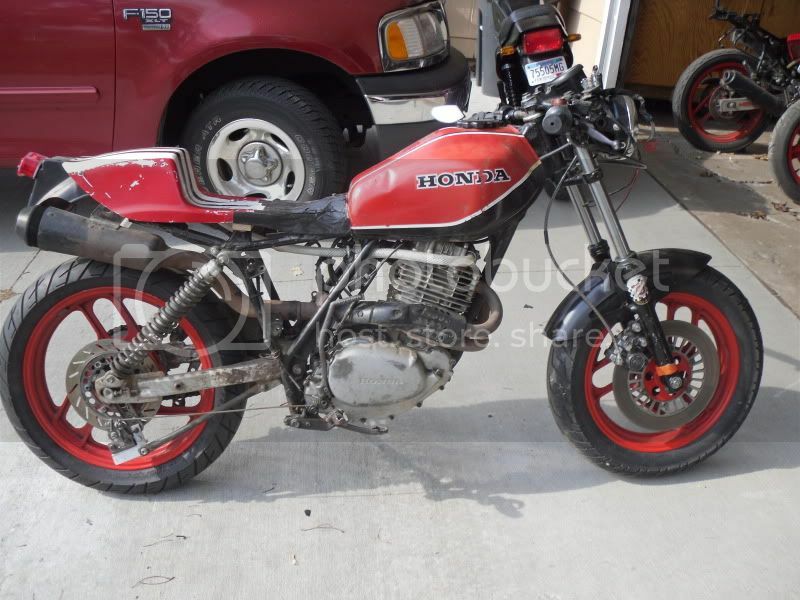 It also has CB700sc nighthawk shocks on it they are longer than stock with adjustable damping and stiffer springs I have used them several times on Ascots and they work great. I can usually find low mileage ones on e-bay. I never pay more than $50 for a pair. Here is a shot when I had 18" wheels on it. I had a VF1100S front wheel and a VF500F rear. They are the maximum allowable width and minimum diameter allowed in the WERA V-2 class. I have a 110-18 Avon Am 22 front and 130/65 - 18 rear AM23 race compound tires on it. It worked pretty good at that race, but the jetting was way off and I didn't get a chance to dial it in since I was racing a different bike most of the weekend. Here is how it sits currently. 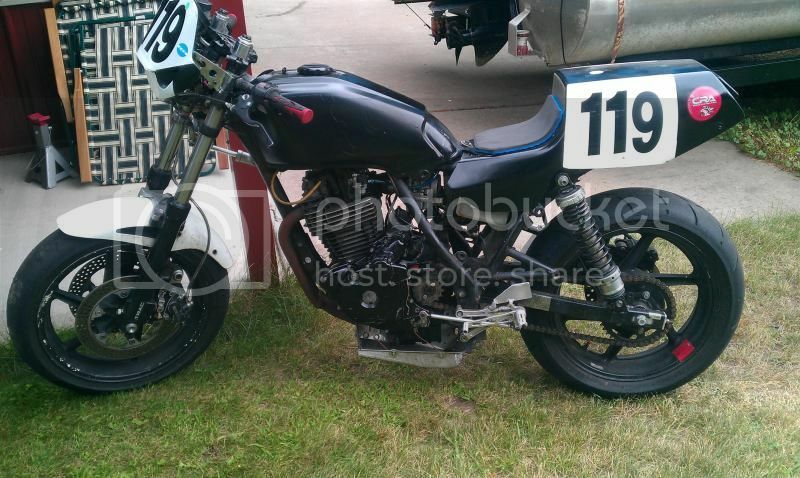 It has a VF750F Intercepter front end on it with CBR600F2 wheels and brakes. I have a 36mm flatslide Mikuni carb and an unknown exhaust header with a shortened D&D can on it. The seat is a replica of a Yamaha FZR750RR OWO1. It still has a stock motor that I haven't gotten around to building up yet. I am about done dialing in the chassis so I will probably do the motor this summer. I have a Megacycle 4421 cam that I have had in my toolbox for 25 years and a Wiseco 12.5 :1 piston. I still need to get some new valves, shortened guides, RD springs and have the rocker arms hard welded and reradiused by Megacycle. Then I will be ready to put the top end together. I don't think the starter motor will turn over the high compression, but it might. If not I may just stick some XL side covers on it and be bump starting it. Not an Ascot, but related. I have a couple of these, too. Nice Ascot! When you install that high compression piston you might consider one of those compression release devices like the Harley big twins use. There are two styles that I've seen. One requires machine work to the head to mount the release valve & a small port from the combustion chamber to the valve. The other one that I've seen, mounts at the spark plug. I have raced with AHRMA in the past in Lightweight Superbike, but mostly in middleweight with my Seca 550. AHRMA races at a number of really long tracks like Road America and that is a bunch of long straights for a single. But at some of the other tracks like Grattan or Barber the singles are great. what are the rearsets off on the black FT ? They are Woodcraft that fit a CBR600F4i. I got them in a box of racing parts that I acquired along the way. They didn't require too much to fit them. ex119, do the names Bill Benton or Joe Hutcheson ring any bells? Bill Benton, no but Joe Hutcheson is a fast guy on a single. Motards mostly as I recall. We have attended the same race weekends, but have not run in the same classes to my recollection. I don't know him, but have seen hiim around the track and the pits. 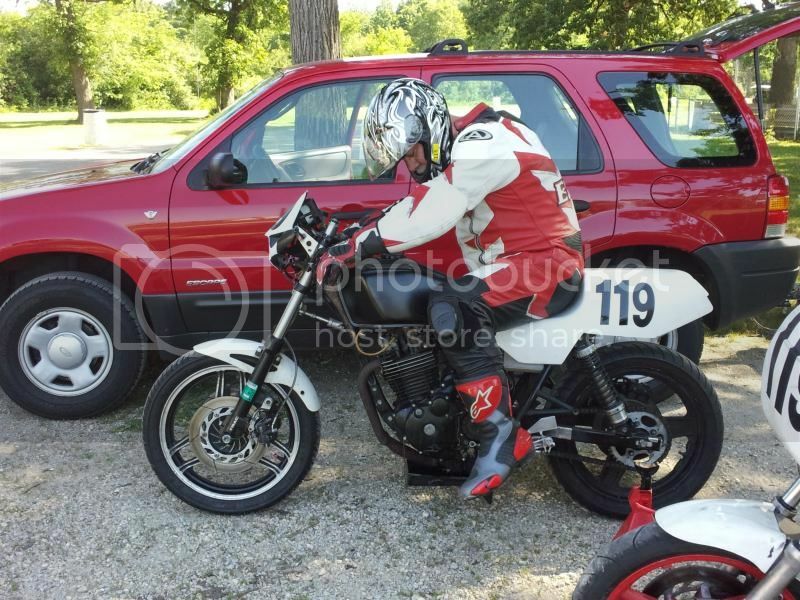 I have not raced AHRMA in 3 or 4 years.